The involvement and generosity of our sponsors and partner organizations is fundamental to our success. We gratefully acknowledge the companies, organizations and individuals whose contributions to our six-home Meadow Hill Development enable us to achieve our goals. If you are interested in partnering with Habitat, contact our administrative office at 250-758-8078 ext 102 or email info@habitatmvi.org. We are proud to have an ongoing partnership with Vancouver Island University. 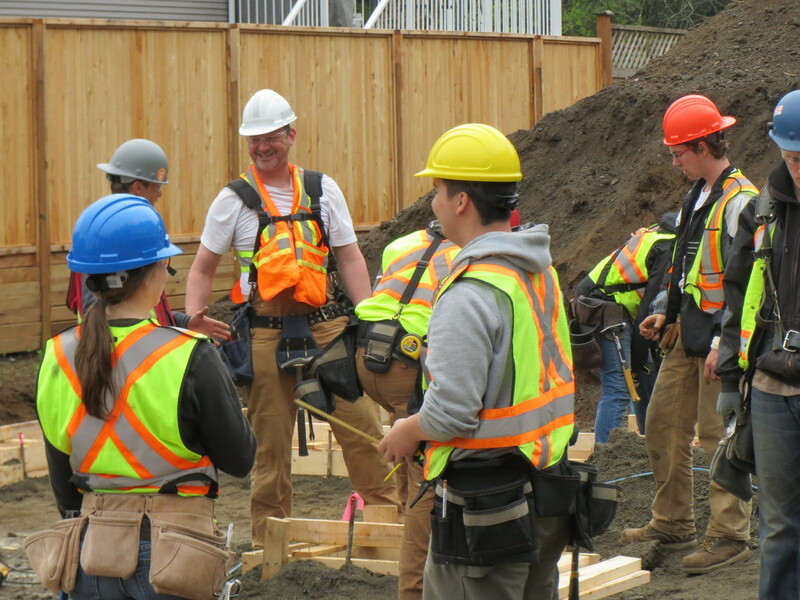 Our Habitat houses are being built with the assistance of VIU Trades and Applied Technology program students. 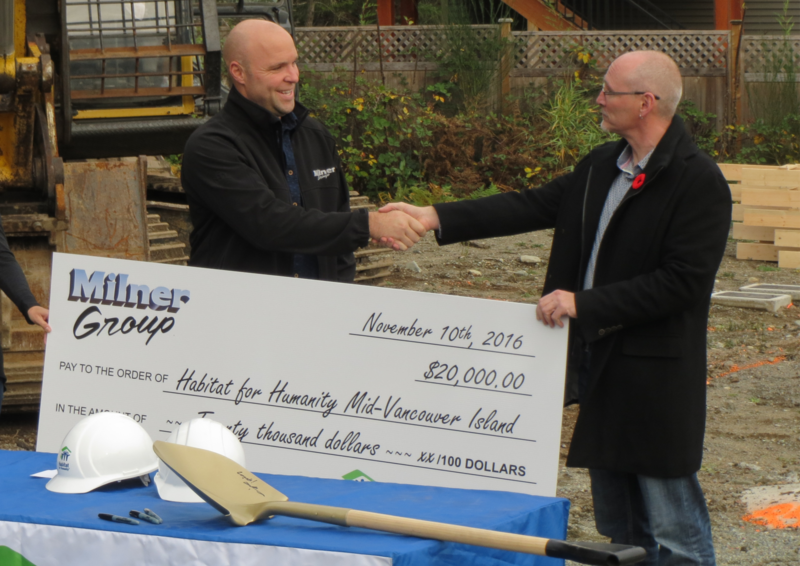 Our unique partnership with VIU enables the trades’ students to participate in a living classroom experience while assisting us with our build needs. The students, under the supervision of their instructor, have worked on excavating the site, the foundations, framing, roofing, etc. for the houses – all valuable experiences. Additionally, the students learn about the Habitat model and the need for affordable homeownership we address in the community. The students and their instructors are volunteering 4,500 hours per house at the Meadow Hill development, receiving hands-on training that they wouldn’t get within the university, and aid them on their own journey to a viable career. 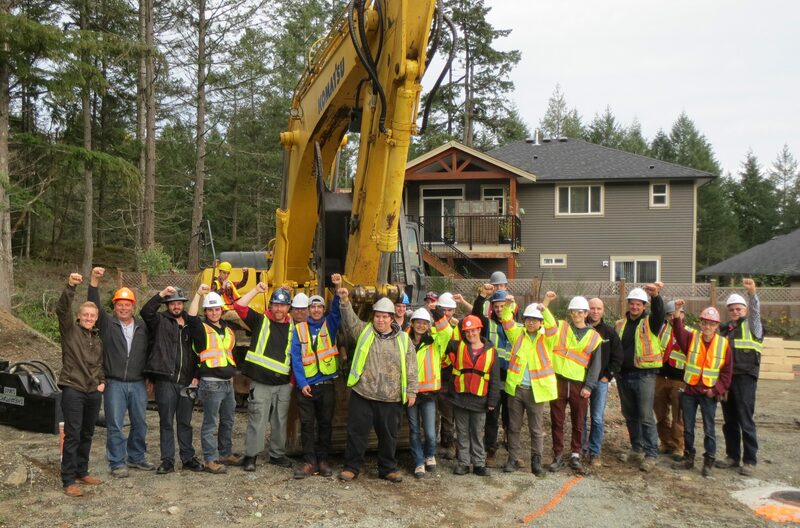 Vancouver Island University Trades’ Students at our Phase 2 Groundbreaking Ceremony at our Meadow Hill Development. 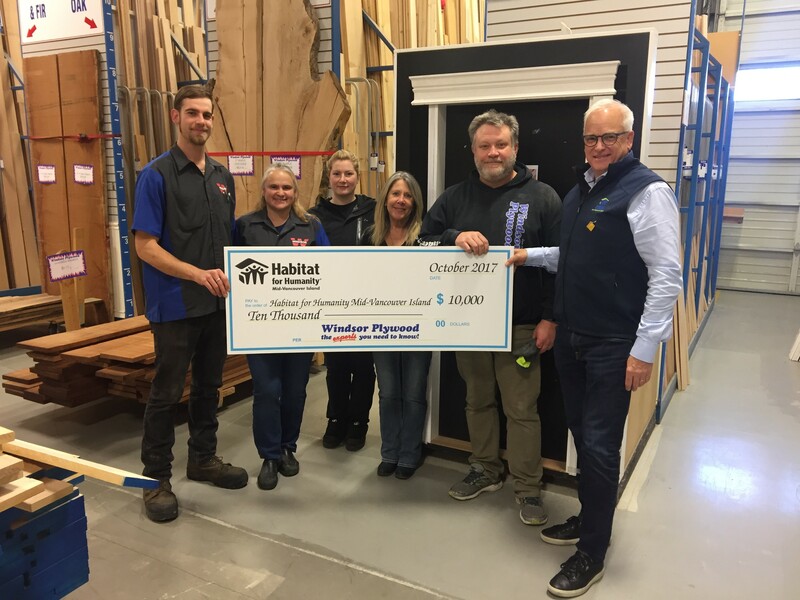 Windsor Plywood Foundation, held at Vancouver Foundation has continued their partnership with Habitat for Humanity Mid-Vancouver Island with another grant for $10,000. Thank you for your continued support in providing our future Habitat homeowners with decent, affordable homeownership! 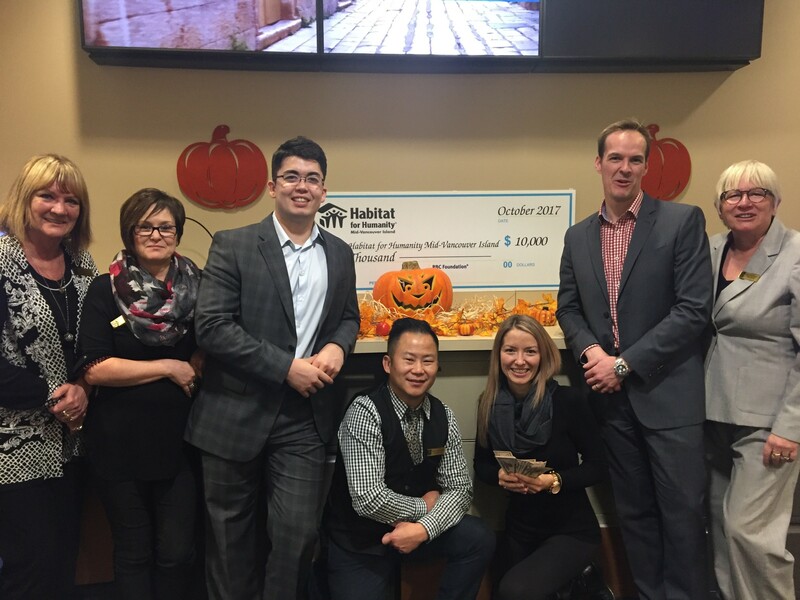 RBC took part in a Landscape Build day on October 24th 2017 and made a donation from the RBC Foundation of $10,000. Thank you RBC. Craig Cookman (left) of Milner Group Ventures Ltd. presenting a donation cheque for $20,000 to our Board Chair, Dave Hitchcock. 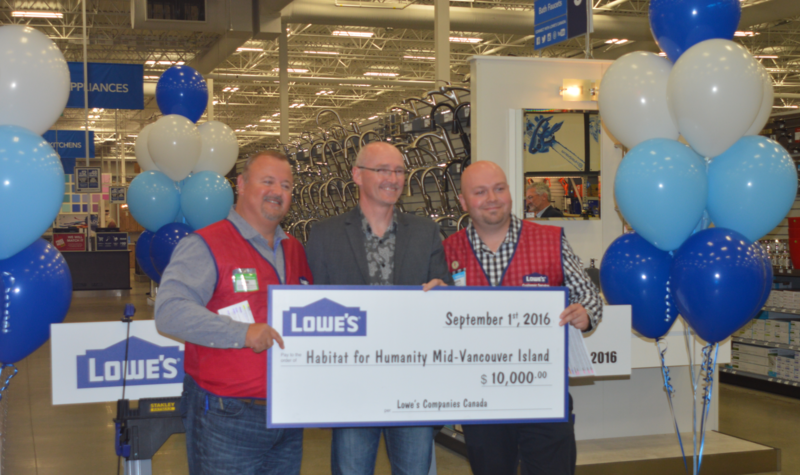 At Lowe’s Nanaimo grand opening, Deryk Mortensen, Lowe’s Nanaimo Manager (right) and Jim Caldwell, Lowe’s Canada President (left) presented a cheque for $10,000 to our Board Chair, Dave Hitchcock.